This is one of my earliest original designs and it remains one of my most popular patterns. If you look closely at the pattern you will notice that it is composed of only a single interwoven line. Many people think this design is Celtic, but I used the traditional Moroccan knotted heart motif. 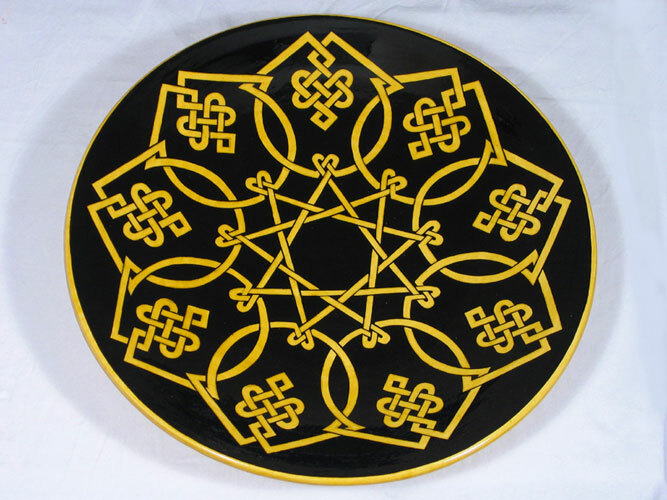 If you count the number of divisions of the circle, you will find that this pattern is divided into nine wings, which is pretty rare in traditional Islamic patterns. In each wing you will find one heart-knot at the tip of the internal nine pointed star as well as two sideways hearts dropping down from the external border. Three hearts and nine wings yields twenty seven lovers. I make this pattern in many colors, so one can have the red hot lovers, the blue lovers or the amber lovers, as well as the illuminated lovers.